Register Log In ECN Forum Forums Photos for General Discussion Residential Service? This was found in a Home that was purchased several years ago. not mentioned anything to the new owners. You said all you needed to say when you mentioned the electrical engineer that owned this house. No insult intended to the EE's participating on this message board. If this is the service panel, where is the service disconnect? 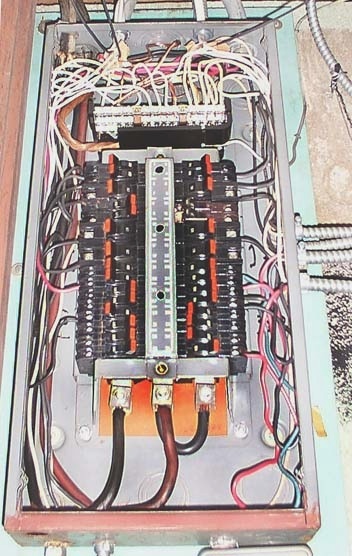 If this is a sub panel, where is the equipment grounding conductor & its busbar? There is a violation for 2 conductors in one lug at the feed eand (bottom). Using a 3 phase panel in this installation may be a listing violation and I would be concerned about multiwire branch circuits overloading the shared grounded conductor. But the worst part is that this is an FPE panel. Visit http://www.inspect-ny.com/ for plenty of horror stories. There is no disconnect. What you see is all there is. This person quite obviously got a used 3 phase panel from somewhere and installed it at home. Notice only about 1/2 the breakers are used. I mean nothing against the EE's either, but some don't realize that there's more to this type of work than the theory they were taught in school. For some reason or another it seems like the EE and some electricans beleive that it is OK just as long as it is their home. Howerever they fail to realized the potinal danger in their pruduent judement. Judging from what I see he or she had used a Used 3ph panel, which in not according to the code as well as no main, Egc. It really doesent supprise me to see this kind of thing. That guy proably was on the code making panel. In case you're wondering, I removed the quote part from your post because having the photo twice in the post really slows down the page loading. My first clue that something was up was seeing all the breaker space used and only about 10 cables going in. What would you say to convince the Homeowner that this is something that should be taken care of? "Sir, would you like to have this situation corrected?" "what do you mean, an EE installed it, it's been fine for years!" "well, you see, there is no main disconnect, the panel is 3 phase, and you are single phase, plus it's a federal pacific!" "This place passed inspection when i bought it, and the power company AND an electrician have seen this and said nothing!" "well, obviously they simply did not concern themselves with the potential hazards here"
" well, i'm not going to concern myself with you, hit the bricks!!!" Your 'Panelside Manner' needs work! I'm workin' on it Boss!!! Are those wires sticking out of the front near the top unterminated grounds? I also see a single conductor (?) stapled down on the right side of the board. This panel must have been a "deal" from somebody who had demoed it ("that's right, I can give it to you for only $20"). They should have thrown it the dumpster where it belongs. The wires sticking out are new circuits not yet connected to breakers. The wire on the right side is the #6 Alum to Waterpipe. I'm thinking that He probably got this from work, maybe out of the dumpster like you said.